Jul 24, 2017-The year 2010 was a major turning point in human history. For the first time, the majority of the world’s population lived in cities. Just 100 years ago, only 20 percent of the global population was urban. With urbanisation, cities have grown to accommodate more people and more buildings. At the same time, however, a greater number of open and public spaces are being lost. Public open spaces are one of the most maligned elements of the urban milieu today. Yet, they remain in the foreground of what a town or city is all about. They are the urban lungs that cities need in order to thrive. They also represent the most substantial physical expression of the town’s heritage. In the west, public spaces are threatened by excessive privatisation. In the cities of the global south—and more specifically in nascent democracies such as Nepal—they are often lost due to conflictual regulations, and a lack of vision. In the wider context of city planning, public spaces have been a diminishing breed that is subordinate to the development hyperbole in cities such as Kathmandu. The 2015 earthquake made the magnitude of their under-provision obvious. 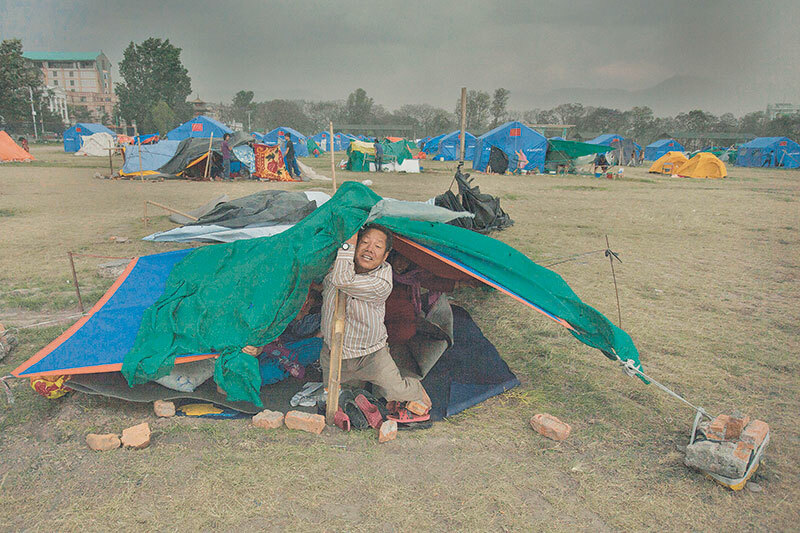 The iconic images of Tundikhel providing shelter to thousands proved that it is not one’s home or a temple, but open spaces that are the safest in times of crisis. Public spaces have many dimensions. They are defined by the activities that take place—the culture and identity of the communities they support. A great public space, first and foremost, is one that is used by people. It is well connected to its surroundings, easy to get to, and holds useful community functions. Although belatedly, in 2015, World Habitat Day was marked by reflecting on ‘public spaces for all’, highlighting that a city’s character is defined by its streets and public spaces. Many cities around the world are now developing innovative ideas to shape new urban identity. These typically include revamped public spaces, rehabilitation of architecture and historic landmarks, re-creation of the street as part of the city’s soul, shaping a ‘sense of place’ with monuments, piazzas, marketplaces and streetscapes as open venues for arts and cultural expression. High-density cities such as Hong Kong and Singapore are developing innovative ideas of sky parks and sky gardens apart from preserving conventional public spaces. The underlying common theme in these initiatives is to enhance publicness, which comes from free access. As the Chilean architect Alejandro Aravena said, the measure of successful cities is how much citizens can do for free. In the aftermath of the 2015 earthquake, it is opportune to cast a holistic view on public space—one of our greatest assets. Of all the public spaces in Kathmandu, Tundikhel has assumed a special place. Not very long ago, the country witnessed a struggle for democratic transformation that originated and culminated in Tundikhel, providing a platform for protests and dharnas. Apart from being democracy’s playground, Tundikhel’s role as a socio-cultural space has had profound effects on people’s well-being. For decades, Ratna Park has been an urban oasis, Ranipokhari a visual delight, Khula Manch a platform where democracies flourished and the rest of Tundikhel a space for displaying national pride (through military parades) and for playing sports. It has also been a site for street hawkers, informal sellers and individuals driven by the broader forces of neoliberalism. Strictly speaking, Tundikhel represents the microcosm of the city and democracy’s truest space in the city. Combine this with its historical role as the trading post during the medieval era, the space to display power and culture during the Rana era and modern Nepal’s first civic space, Tundikhel is entrenched in the everyday lives of Kathmandu’s residents. This rich tapestry of history and democracy is however under threat and much of this threat owes itself to the burden of institutional intervention articulated by the troika of institutionalisation, militarisation and informalisation. Early interventions in Tundikhel aimed at modernising the city by constructing perimeter roads to create Kathmandu’s first tree-lined boulevard, where social mores and elite values were enacted and embodied. These were noble intentions indeed, but they also altered the configuration of Tundikhel and significantly reduced its size. In the past half century, Tundikhel witnessed the introduction of Ratna Park in 1962, Khula Manch in 1973, and construction of the parade ground in 1983. These interventions counter-intuitively led to the fragmentation of this linear space, creating boundaries and simultaneously helping to strengthen institutional controls over much of its space. This curtailed the publicness of the space. Segregation and fragmentation have been the two enduring trends of Tundikhel’s radical erosion, shrinking it from 60ha to 30ha over the span of mere 100 years. This has both physical and symbolic aspects. The former is most visible at the southern end that is predominantly under Nepal Army’s occupation. The space to the south of Shahid Gate, once an integral part of Tundikhel, is rapidly turning into a construction site. Starting with the Army headquarters in 1983, the construction of ancillary buildings in successive decades and a stadium in recent years has undermined its openness. While part of this space is used as a training ground, it remains in exclusive use of the Army and disconnected from Tundikhel. The latter is epitomised by the recent decision by Kathmandu Municipality to turn Ratna Park into a paid-for park. This neoliberal interjection, regardless of any noble intentions, brings it under the exclusive domain of elite residents, excluding the city’s poor, informal traders or the homeless, creating its own list of gentry who are worthy of being called ‘the public’. Next door, the mute existence of Rani Pokhari, with 10-feet-high vertical bars obstructing both the view and access, is separated from public life. A century of restrictions in accessing Rani Pokhari has successfully erased a landmark public space from memory. The decision to use Khula Manch as a bus park undermines its firmly established purpose in recent decades. The burden of the institutional transgression is such that only one-sixth of Tundikhel is open to the public today. Barbed wires, high iron gates, Army patrols, and municipal wardens create boundaries and prevent access rarely seen anywhere else. Tundikhel is no longer a pure, autonomous repository of space but instead subject to institutional heavy-handedness. There is significant apathy towards the city’s informal traders who are forced to sit just outside Tundikhel’s boundary. Tundikhel today is adorned with hard boundaries that uphold territoriality and undermine civic engagement, showing the state’s approach to treating public space in the same way it treats buildings or objects—assigning territories and boundaries that ignore the socio-cultural role it plays. Given the lack of publicness, what remains of Tundikhel is the illusion of space that is neither real nor imagined. Boundaries of knowledge are constantly being established, deconstructed and reformed. Gleb Lebedev, a contemporary Russian activist and theorist, has developed the theory of the topochrone—a reversal of the history prioritising place over time, and emphasising the memory and the spirit of the place. According to him, if a city like Petersburg had not existed, it would have had to be invented. In this sense, the origin of Tundikhel is neither accidental nor serendipitous. It was a conscious product developed over time by the society and enriched with their socio-cultural beliefs. Going by Lebedev’s theory, if Tundikhel did not exist today, it would have to be invented. Let us start its reinvention. Not just Tundikhel, every inch of public space that is at risk of disappearing deserves reinvention. The ongoing intervention of public space in Kathmandu undermines history and contemporary needs, which must be resisted.